TORONTO – Sherritt International Corp. has published its 2018 year end production numbers, some of which outstripped guidance and some of which fell short. The company also supplied guidance numbers for 2019. At the Moa joint venture in Cuba, 2018 finished nickel production was 30,708 tonnes, despite bad weather, transportation delays, and disrupted hydrogen sulphide supply. Cobalt production at Moa was 3,234 tonnes, slightly below guidance. Sherritt has put 2019 guidance numbers for Moa at 31,000 to 33,000 tonnes of finished nickel and 3,300 to 3,600 tonnes of cobalt (on a 100% basis). 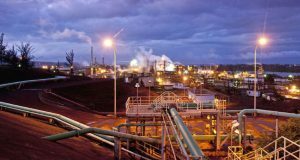 Output at the Ambatovy joint venture in Madagascar were below guidance at 33,185 tonnes of nickel. That was a couple thousand below guidance because Cyclone Ava caused extensive damage to the site. At 2,825 tonnes, cobalt production was also low. This year Ambatovy is expected to produce 40,000 to 45,000 tonnes of nickel and 3,500 to 4,000 tonnes of cobalt (on a 100% basis).